This is a Japanese species, and Salvia koyamae with its trailing habit makes an excellent ground cover plant for a shaded position. As it flowers late, it is best regarded as an autumn flowering species, however flowers will appear in summer as well. 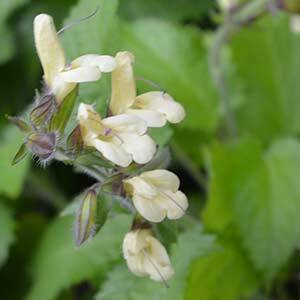 Also know as the Yellow Woodland Sage as well as the Japanese Yellow Sage. Flowers are a pale yellow while foliage is a mid to pale green. The plant most widely offered is Salvia koyamae ‘Yamagata’. The foliage is slightly hairy with leaves being broad and with a triangular shape, attractive in itself ,which when added to the pretty yellow flowers provides interest over a long period. Flowers will begin to appear in mid to late summer and will continue through to autumn. This is unusual for a Salvia in that it requires a shaded position to perform at its best. It is native to woodland areas on the Island of Honshu, a few cultivars are available. A humus rich moist soil is best. This is a trailing plant and will spread by runners. It will also self seed in good conditions. Use as a ground cover plant beneath evergreen or deciduous trees. A good foliage and flowering species for shade. Spread – Will spread to around .5m and will creep to cover a wider area over time. Position – Part sun to dappled shade. Flowers – Pale Buttery yellow. Propagation is easy by division or by separating runners from the parent plant. Also possible from seed..